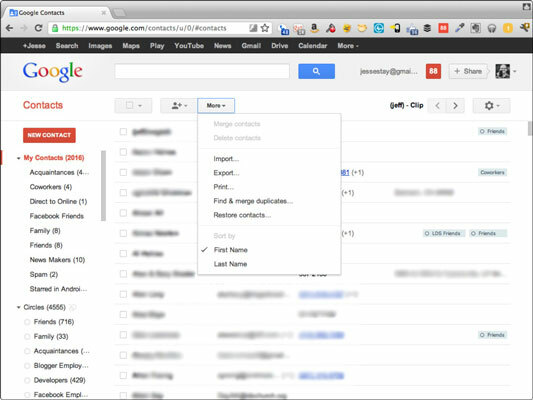 To maximize your marketing potential with Google Contacts, you need to know how to merge your contacts. This can be useful when organizing your company for CRM (customer relationship management). You can let Google automatically merge duplicate contacts by clicking the More drop-down list in Google Contacts and selecting Find and Merge Duplicates. However, letting Google do this automatically causes too many problems; try to do it manually as much as possible. Check the check box next to more than one contact you would like to merge. As you’re searching for names, and you see more than one of the same name (or similar names), check the box next to each one you think is the same. Click the More drop-down arrow and select Merge Contacts. You’re taken to the Merged Contacts page. Google takes all the information from all the contacts you chose and combines them into one large profile. Edit the merged contact to look the way you want it to be. There will likely be old — or wrong — information that was stored incorrectly in the other duplicate contacts here, so delete anything that’s wrong, and make sure the contact is clean. Your changes will be saved automatically. Now you should have just one contact that will always link to the correct Google+ profile when you’re in various Google products.